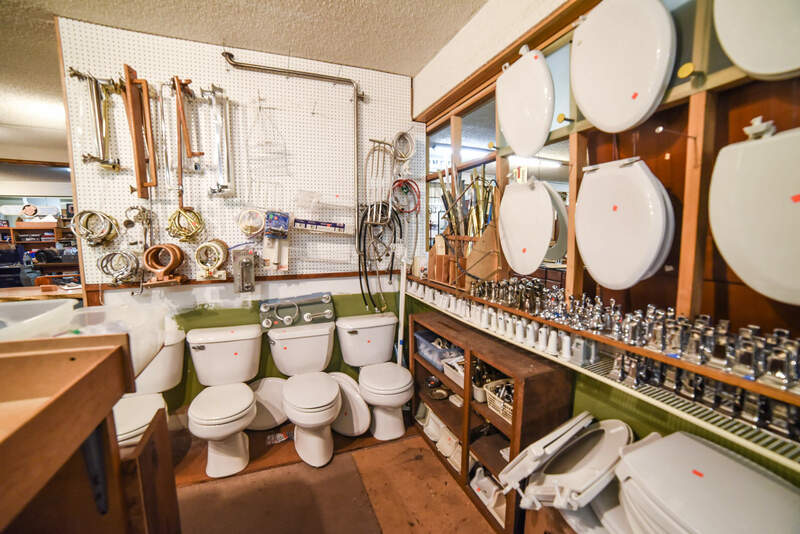 Contrary to popular belief, used toilets are just as great as brand new ones purchased from big-box stores. In fact, purchasing a used toilet can save you a few hundred dollars. Here at The RE Store, we have strict guidelines for accepting donations of used toilets– meaning you’re guaranteed to find a clean and useable model that’s low flow and compliant with current environmental efficiency standards. Now all you have to do is pick the right size and style! Don’t know where to start? Here are 8 quick tips to get you going. Measure twice, shop once. Before you head to the store, measure your space. You’ll want to measure the rough-in, which is the distance from the center of the toilet flange (the bolts from floor to toilet) to the wall. Choosing a toilet that fits that rough-in distance will save you from having to move the flange or shop again. You’ll also want to measure the space, especially if you’ve got cramped quarters, or want a larger or taller bowl, to make sure the whole toilet will fit. Choose the right supply hose. It may be that your current supply hose is perfectly reusable. If not, be sure to select a supply hose that has the right size fittings, and connects the wall and tank without much slack. Ideally, the perfect fit has a slight, but not “s” like, bend. Check twice to save a pain in the neck. We do our best to inspect every toilet, but minor damages or cracks may slip past. Give your new throne a thorough once-over to ensure it’s up to task. Always shop low flow! Our household sinks, showers, and washing machines use the same limited water source. By shopping low flow, you’re helping to conserve water and keeping up with latest technology. We only accept low flow toilets, so you’ll rest easy knowing that the hardest part is down. Pick your seat! First off, ensure your new toilet has a seat. Then, check to make sure it’s comfy. Believe it or not, you spend a lot of time in the bathroom and different seats fit different bodies. The technical stuff. Take a look at the guts, or the innards of the tank, and make sure the flow regulator, swing arm and intake are there. Once again, check for damage. If you have damaged or missing parts, our staff can help you choose the right pieces to complete your purchase. Hardware is hardly a laughing matter. Don’t forget to get the proper nuts, bolts, and washers for proper installation. You’ll need two sets of hardware – a set to connect the floor and tank, and a set for the tank and bowl. In between those sets you’ll need gaskets. If your toilet doesn’t have these, don’t fret. We’ve got what you need in stock, and if we don’t have exactly what you need your local hardware store can help out. Not one, but two wax rings! The wax ring is the final piece of the puzzle. As its name suggests, a wax ring is a ring of wax that helps ensure a proper airtight fit between toilet and floor. Geoff, our resident plumbing expert, advises using two wax rings – one with horn and one without. The ring with horn should be placed first into the floor, and the second ring should be placed on top. If you’ve successfully installed your new toilet, the old one can be disposed of for a small fee (approximately $3 for used toilets) at RDS on Slater Road. When the market allows, RDS recycles these toilets by crushing the porcelain into sparkly aggregate for sidewalks and other concrete applications. Have questions on purchasing or installing a toilet? Our expert staff is ready to help, stop on by or give us a call at (360) 647-5921.